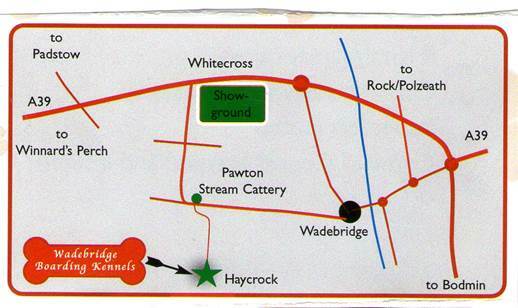 Coming from Camelford or Bodmin direction, take the Wadebridge bypass (A39), straight across the roundabout, past the Royal Cornwall Showground to the western end and Turn Left at the crossroads signposted Tredruston,Polmorla & Pawton. After a few hundred yards you come to a minor cross roads , straight through the crossroads Follow the road to the bottom of the hill where there is grass triangle & a finger post sign pointing to the left marked Wadebridge . Bear sharp LEFT towards Wadebridge, almost immediately on the RIGHT is a lane going up the hill with a White Arrow marked ” Kennels 1 mile (Pawton Stream Cattery is opposite this turning) continue for one mile up the hill passing some derelict farm buildings (not ours), the house and Kennels are just the other side at Haycrock. If coming from the Truro direction on the A39 Atlantic Highway, head towards Wadebridge, past Winnards Perch roundabout and then past the Padstow turning on your left. After half a mile there is a 30 mile an hour speed limit, 100 yards after Turn Right at the crossroads (Whitecross) signposted to Tredruston, Polmorla & Pawton.